During each week of this holiday season, we’re highlighting a couple different categories in the Gift Guide to bring our best ideas directly to you. Today we’re talking about Gifts For Everyone. Need something special for coworkers and friends? Or for the hostess to whose guests she graciously attends? Think of things we could all use, or what jumps out as you peruse. With holiday spontaneity you just can’t lose. From fragrances and soaps to candles and bath salts, from books and silly socks to watches that won’t halt. Hit up the market for something fresh from the farm. Try a gift card, or coffee—a winter warmer sure to charm. We’re in the gift shopping homestretch, but it’s not too late to get something really special from our local Junction shops. When time is a factor and you’re trying to tie up those loose ends on your list, you can depend on your neighborhood stores to have the expertise and willingness to help make gift buying actually fun! We’ve also put together a special category of gifts in the Gift Guide that are perfect for those people in your life that are just a tad more challenging to shop for. 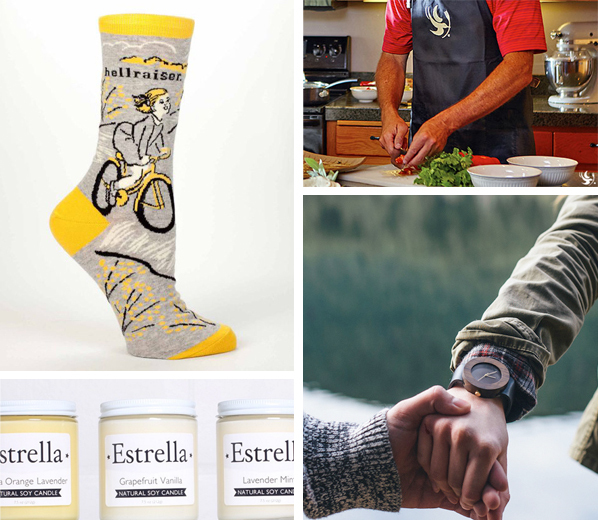 These gifts are ones that almost anyone would enjoy – and many are perfect for guys and gals alike. Here in Seattle, coffee is king, so why not share some of the best with your friends and family? At Hotwire Online Coffeehouse they have a great selection of fun gifts for those who enjoy a good cup. In addition to carrying a whole assortment of travel mugs and cups, they also have their own house-preferred coffee beans for sale in a variety of roasts. For a quick host or hostess gift, pick up some coffee at Hotwire and then head across the street to JF Henry Cooking & Dining for their exclusive Alki Lighthouse Kitchen Towels. 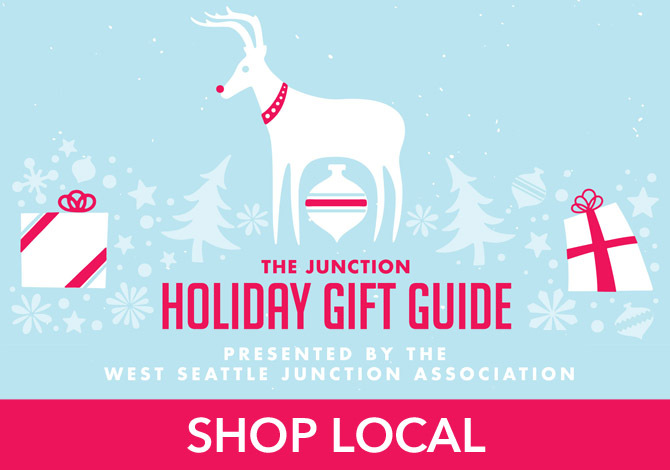 It’s the perfect local gift that shares how much love you have for West Seattle! For gifts for both guys and gals, stop in to Click! Design That Fits, VAIN, Northwest Art & Frame, and Wallflower Custom Framing. Almost everyone can appreciate a beautiful timepiece, a great candle, some fun, quirky socks, or a unique work of art. These shops carry these great items, plus more gift ideas for those folks who are a bit harder to shop for. Finally, everyone loves to eat, and when you give the gift of a family meal together you can bet that it will be appreciated and loved. Dream Dinners has gift cards to help anyone bring a homecooked meal to the table – cooking expertise optional! Pair that with some great selections of artisanal, local foods from the West Seattle Farmers Market and you’ll have something really special! There is so much more to discover in the Gifts for Everyone section of The Junction Holiday Gift Guide. There you’ll find shopping lists, maps, links, and other fun tips to help you make-merry this season!